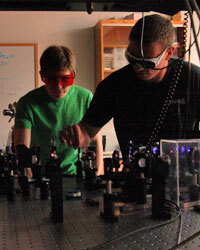 The BA in Physics Education allows students to obtain a physics education degree and certification for teaching high-school physics in a four-year program. Physics education majors must satisfy a broad range of requirements in physics, education and other areas required for certification. Therefore, it is essential that students entering this program contact the Physics undergraduate advisor before registration and then continue to work closely with advisors in the Physics and Education departments as they progress through the program. At a minimum, all freshmen who intend to pursue the BA in Physics Education should plan to complete PHYS 105 (or PHYS 106), PHYS 121, MATH 151 and MATH 152, CMSC 104 and PSYC 100 by the end of their freshman year. We recommend that Physics Education majors register for the honors section of PHYS 121 (PHYS 121H), if available. Download the BA in Physics Education brochure (PDF) for more information.